Yamato Takeru (ヤマトタケルノミコト, Yamato Takeru no Mikoto), originally Prince Ōsu (小碓命, Ōsu no Mikoto), was a Japanese legendary prince of the Yamato dynasty, son of Emperor Keikō, who is traditionally counted as the 12th Emperor of Japan. His name written in kanji can vary, in the Nihon Shoki it is spelled 日本武尊 and in the Kojiki it is 倭建命. His history is uncertain but based on the chronicles his life can be calculated. He was born circa 72 and died in 114. Details are different between the two books, and the version in Kojiki is assumed to be loyal to the older form of this legend. Prince Ōsu slew his elder brother Ōsu (大碓皇子, Ōsu no Miko). His father, the emperor Keikō, feared his brutal temperament. To keep him at a distance, the father sent him to Izumo Province, today the eastern part of Shimane Prefecture, and then the land of Kumaso, today Kumamoto Prefecture. However, Ōsu succeeded in defeating his enemies, in the latter case by cross-dressing as a maid attendant at a drinking party. One of the enemies he defeated praised him and gave him the title Yamato Takeru, meaning The Brave of Yamato. But Emperor Keikō's mind was unchanged. Anthropologist C. Scott Littleton has described the Yamato Takeru legend as "Arthurian" due to some structural similarities with the King Arthur legend. Common points include the use of two magic swords, of which the first validates the authority of the hero; the leadership role of a war band; the death to an enemy after giving up the sword to a female figure; a transportation to the after world; and others. Littleton proposed that both legends descend from a common northeast Iranian ancestor. One of the feats of Yamato Takeru was recounted in the "Grasscutter" volume of Stan Sakai's graphic novel series, Usagi Yojimbo, as well as the legend of how Kusanagi-no-Tsurugi was transferred to the Atsuta Shrine. The second book of Noriko Ogiwara's The Jade Trilogy, Mirror Sword and Shadow Prince, is a retelling of Yamato Takeru's legend. The novel follows Oguna, a.k.a. Prince Ousu, one of the two main protagonists. Yamato Takeru is seen in a dream in the epilogue to "The Golden Princess", one of the Novels of the Change. The sword itself is the major plot point. ^ Ponsonby-Fane, Richard. (1953) Studies in Shinto and Shrines, p. 433. ^ Littleton, C. S. (1995), p. 262. ^ Littleton, C. S. (1995). Littleton, C.S. 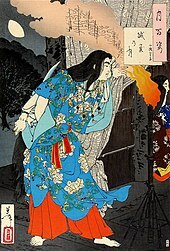 Some Possible Arthurian Themes in Japanese Mythology and Folklore. 1983. Littleton, C.S. 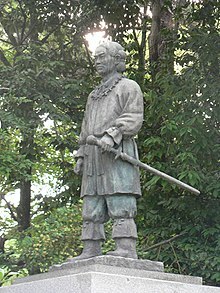 Yamato-takeru: An "Arthurian" Hero in Japanese Tradition. 1995. Wikimedia Commons has media related to Yamato Takeru.